Today, on International Women’s Day as we celebrate the social, economic, cultural and political achievements of women, I wanted to tell you about my week. In February, I received a letter from AIB telling me that I had secured a place on the AIB ‘Women in Enterprise’ Growth Academy Programme. 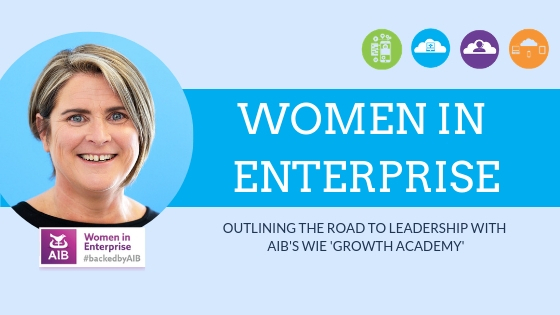 AIB is offering the Women in Enterprise programme to ambitious female entrepreneurs and business owners because women want coaching, mentoring and connectivity in a way that helps them take their business to the next level of growth. The programme is led by Joanne Hession and a host of expert trainers from The Entrepreneurs Academy. Joanne is passionate about authentic leadership in entrepreneurs and is excited to be driving AIB’s Women in Enterprise Academy with an amazing team in 2019. The enthusiasm of everyone involved is contagious and creates an air of excitement. Lorraine Greene from AIB and Sarah-Lyn McKenna from the Entrepreneurs Academy created the perfect duo as they greeted each participant upon arrival at 7.30am last Wednesday morning. The first day of my journey was titled “Leading myself,” with an interactive workshop that made me have an in-depth look at myself as a Leader. As a woman in the Technology business who’s skill set is not technical but instead people management, I found the shared knowledge and experiences around the room invaluable. Twenty powerful ladies all from completely different industries bound together with a common goal to become a better leader. For me, the success of this programme will be that I can not only improve my skills as a successful business leader, but that I also develop as a person and become a leader throughout my life. I would like my employees to see me as a great leader; for them to trust me, to know that I will always listen, that I have integrity, that I want to help their personal development, and more than anything, I want them to be happy. I’m so thankful for this opportunity and plan to embrace every aspect of the next 4 months. I’ve started a Leadership Journal and began reading ‘The 21 Irrefutable Laws of Leadership’ by John Maxwell, which is fantastic. I see these 4 months as a path to self-improvement and I’ll keep you updated as my journey continues. Previous post Is it Time for a Secure Digital Workspace?